You're expecting a baby? Congratulations! Have you been asked by everyone you know if you’re planning on doing a photo shoot with your new bundle of joy? Are you planning on trying? You should! You can use your skills and knowledge to produce beautiful DIY newborn portraits all on your own. All you need is a little patience. Ben is my third little one. He joins his big brother (4) and big sister (2) in our crazy household. I knew before he arrived that I wanted to try and do my own newborn portraits photos this time around, and that it was going to require a little planning and patience. Here’s how I pulled it off. I didn’t know if I was having a boy or a girl, so for the formal, posed shots, I pulled together all the newborn props I might need for either, and made sure everything was clean and set up in my makeshift studio. I had a c-section, and I knew I would be tired (oh hi, exhaustion, haven’t seen you since the last time we did this baby thing! 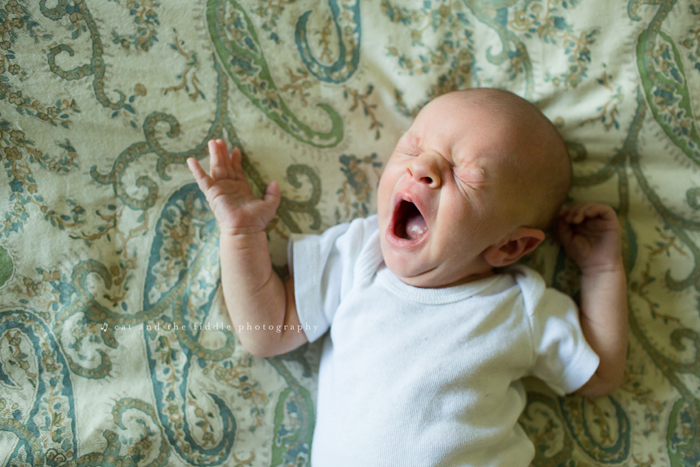 ), and I knew I wasn’t going to be up for the physical parts of setting up a newborn shoot. I was right! I was so pleased that everything was ready and waiting for me when we arrived home. I knew that when my baby and I were ready for our photoshoot, all I had to do was pick up my camera. In addition to setting up my studio, I went through my house and made a list of all the specific shots I wanted to get. I also looked through Facebook and Pinterest and bookmarked favorite newborn poses and shots I had seen others do. If there is ever a time to practice, it’s with your own baby! If you don’t have a studio space in your home or good studio lighting, I would still suggest putting together as much of the setup as you can (props, beanbags, blankets, wraps and hats) and putting it all in one spot - somewhere safe and easily accessible, so you will have minimal setting up to do when you are ready to go! It’s important to remember that your baby knows you. 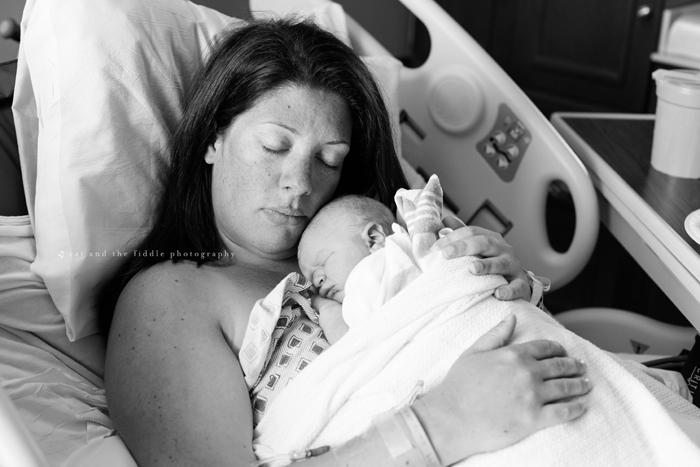 This time, not only are you the photographer, you are also MOM – the source of love, comfort, and even food for your newborn. When you hold your baby, it can be difficult to get him or her into a deep sleep, because they often want to snuggle and eat. I know when I held Ben to try to shush and rock him to sleep, it could take quite a while to get him into that deep, posable sleep. He wanted to eat, eat, eat, eat. Combine this with the exhaustion that starts to set in, and it could be a recipe for disaster. This is where patience is important. Even if you are a newborn photographer, you should understand that getting your baby to do what other babies do for you every day may not be as easy as you’re used to with clients. I gave myself a goal of getting through one setup (one backdrop and all the associated props) each day, and that way I was making sure to take care of my own health – I did just have a c-section and I didn’t want to push myself! - while still making sure I was getting the shots I wanted. I ended up getting all the posed shots I wanted with Ben over nine days. 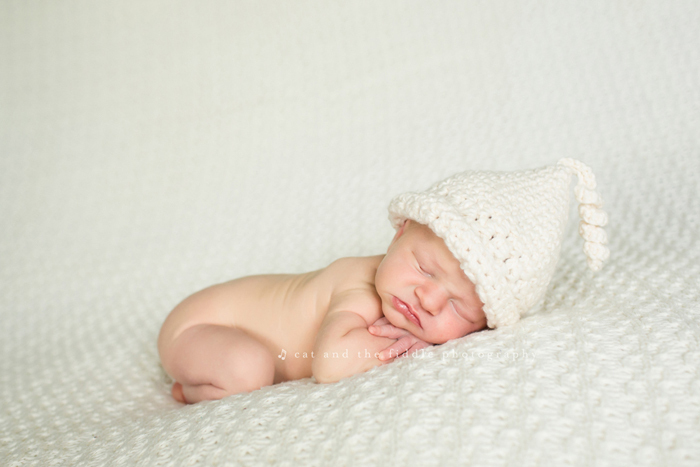 Take Some Newborn Lifestyle Shots! While posed shots require a lot of work and forethought, lifestyle shots are much more spontaneous! Its a good idea to make sure you have your camera accessible so you can shoot when the inspiration hits. The master bedroom can be a great place to start. Wrap your baby in a swaddle blanket, place them on your master bed, and capture them just as they are in the moment. Photography them in their nursery, with Daddy, in their swing, wherever you see the light and the story. Just make sure to clear away the dirty diapers, burp cloths, and remember to take a final look throughout the frame to be sure you haven’t left something there that you don’t want to be there. Even though your newborn lifestyle shots will spontaneous, you still want to keep your story in mind – if something in the frame doesn’t contribute to the story, remove it. Alternatively, if you want to tell the story of those first crazy, hectic, messy days, leave the mess in the frame. When Ben was about 8 days old I put him in a white onesie and carried him around the house and shot in many spots, wherever I saw beautiful light. It only took a couple of hours, and I ended up with some of my favorite images. Don’t forget to start your photos in the hospital as well. And you can give the camera to your husband, too! There's a fine line to walk between getting the shots you want, and putting too much pressure on yourself to do so. Remember that, unlike with a client, you have access to your baby 24/7. Try to challenge yourself to shoot daily for the first two weeks of his life, but only take the amount of shots per day you feel comfortable with. Some days I would do a full posed session and some days I would just take a few quick lifestyle snaps. There was one day I didn’t shoot at all, and just laid there staring at him and smiling all day. In the end, I was glad I pushed myself to shoot as much as I did, and I’m glad I also gave myself breaks. Make sure to listen to your body and your baby. Know when to push yourself and when to take a step back and relax. I have an obsession with baby lips and the peely skin on babies hands. I really do. But, there are also tiny ears, noses, fingers and toes, miniature cowlicks, and itty bitty belly buttons that are all begging to be captured as well. In one of my lifestyle sessions with Ben, I slapped on my macro lens and made sure I got at least one shot of all those things. 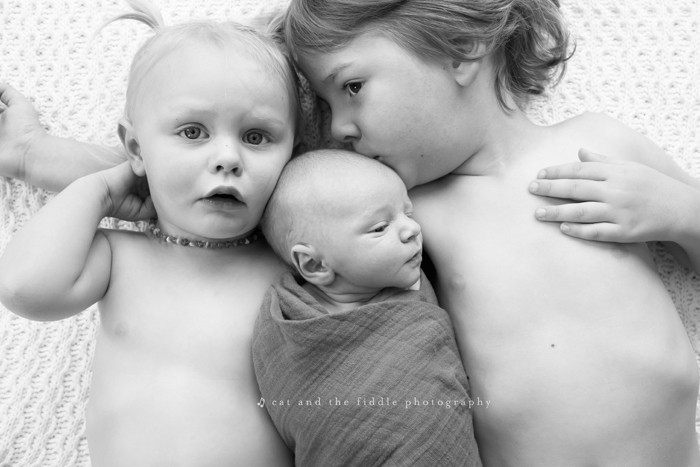 In exactly one hour, on one afternoon, I was able to take my all time favorite shots of my 3 children together. My two year old and a four year old were not interested at all in helping with my photo shoot. I had an idea of what I wanted, so I set it up, brought everyone in and got it done. Its a good idea to have everyone lying down, so you don’t have to worry about brother or sister dropping the baby. Safety first! Seriously. It can be hard to remember to follow all the safety rules when it’s your own baby and family. 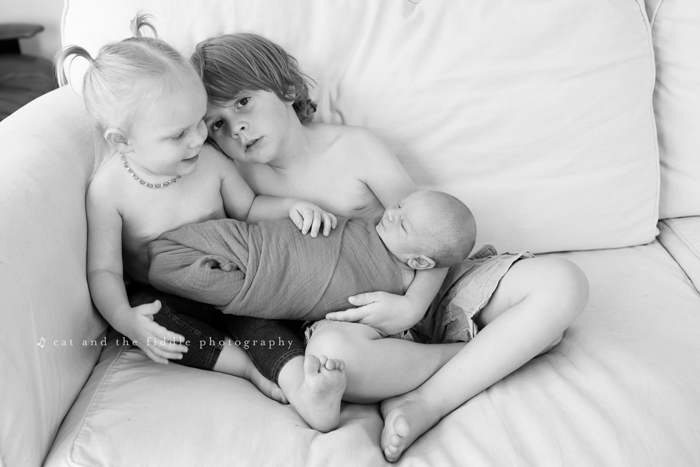 When I was shooting my children all together I asked my sister to come over and give me a hand. Her job was to watch out for the baby and take care of him while I was shooting so his big sister wouldn't poke him in the eye and keep his big brother from walking away while holding him. This might sound contradictory, considering I have just spent all this time telling you to shoot shoot and shoot some more on your own… but you should also have a back up plan in place, and hire a professional photographer to come and take some pictures as well. I adore the pictures I took of Ben, and I’m so very glad I have them – but I also knew going into it that I wanted pictures of our whole new family as well. I’m very glad I have those too. And worst case scenario, if I’d somehow not felt up to shooting, or if I’d missed something, or if I’d had an equipment malfunction, or if I was just in one of those funks that happen (you know what I’m talking about, right? ), I knew we would be covered, and still have beautiful portraits of my beautiful baby. 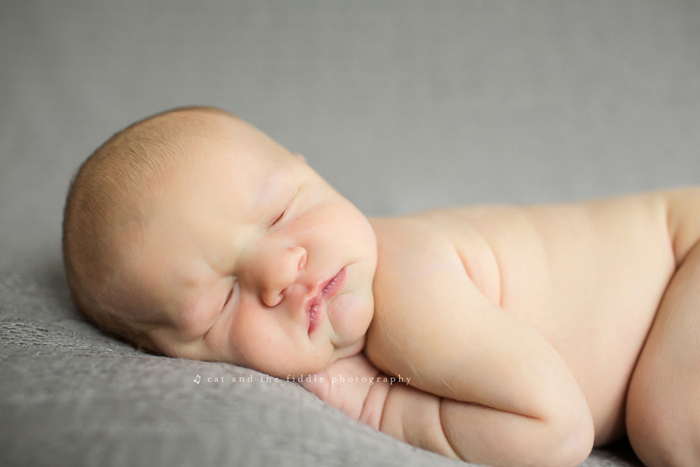 If you are looking for help when it comes to newborn editing and want to save more time when editing newborns in Photoshop -- you must try Pretty Actions LUXE Newborn Complete Workflow Collection, you'll be so happy you did! P.S. - If you prefer to edit in Lightroom, Pretty Presets for Lightroom just released their fabulous Baby Bella Newborn Workflow which includes tons of presets and brushes - everything you need to edit newborns in Lightroom! 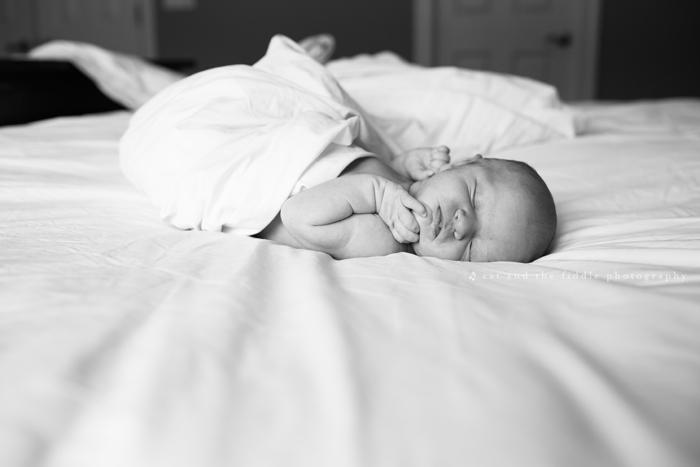 Do you have any questions or comments about Photographing Your Newborn? Leave us a comment below - we would love to hear from you! And please share our tutorial using the social sharing buttons - we really appreciate it! 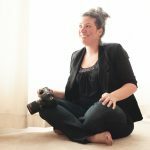 Emily, of Cat and the Fiddle Photography, is located on the Eastern Shore of Maryland where she spends her time chasing her three wild little ones and downing more coffee than should be humanely possible. She loves to travel, lives for the beach, and is grudgingly training for a half marathon. Emily shoots with a Canon 5Dmkiii and a variety of L lenses. She focuses on newborns, families and weddings, and loves using her camera to tell people's love stories.